Basel, November 14, 2016 - Novartis ranked third in the 2016 Access to Medicine Index (up from 4th place in 2014), in recognition of its efforts to improve worldwide access to healthcare. The Index measures the performance of the top-20 pharmaceutical companies to improve access to medicines and healthcare in developing countries, and is conducted every other year. It covers seven categories, including access-to-medicine management, capacity building, pricing, manufacturing and distribution. "We share the fundamental aim of the Access to Medicine Index: to close the access gap in developing countries," said Joseph Jimenez, CEO of Novartis. "We are delighted that our actions have been recognized, but more work is needed. In order to improve access even further, we will continue to work on creating more scalable and sustainable approaches to increase the affordability and availability of medicines to underserved patients." 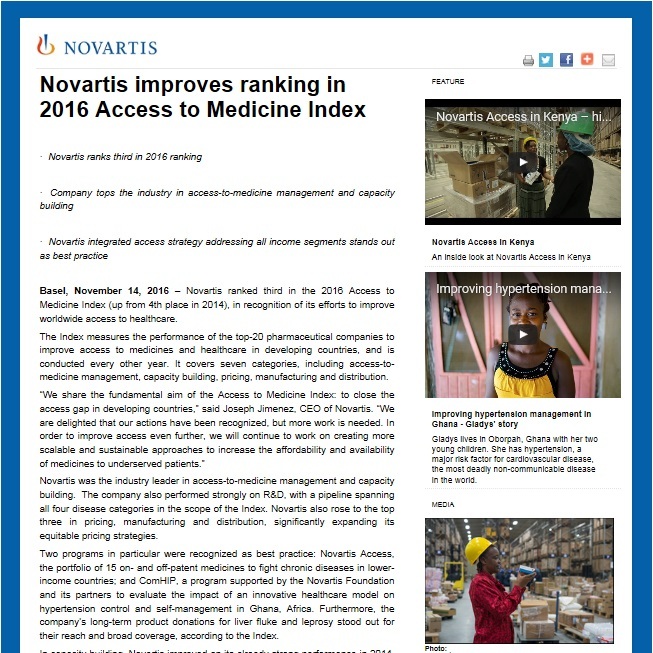 Novartis was the industry leader in access-to-medicine management and capacity building. The company also performed strongly on R&D, with a pipeline spanning all four disease categories in the scope of the Index. Novartis also rose to the top three in pricing, manufacturing and distribution, significantly expanding its equitable pricing strategies. Two programs in particular were recognized as best practice: Novartis Access, the portfolio of 15 on- and off-patent medicines to fight chronic diseases in lower-income countries; and ComHIP, a program supported by the Novartis Foundation and its partners to evaluate the impact of an innovative healthcare model on hypertension control and self-management in Ghana, Africa. Furthermore, the company's long-term product donations for liver fluke and leprosy stood out for their reach and broad coverage, according to the Index. In capacity building, Novartis improved on its already strong performance in 2014. The Index highlights the company's engagement with the University of Cape Town in South Africa on malaria and tuberculosis drug discovery, as well as the award-winning SMS for Life program, a public-private partnership to manage medicine stocks in sub-Saharan Africa. SMS for Life has been piloted in more than 10,000 healthcare facilities and is being scaled up using smartphones and tablet computers. Novartis pursues a combination of approaches to expand access to its medicines - philanthropy, zero-profit initiatives and social ventures. In 2015, the company's access-to-healthcare initiatives reached almost 66 million patients globally, and training and healthcare service programs reached 12 million people.